Over the past decade, modern mixology has brought the cocktail culture home and has inspired bartenders from all over the world to experiment with new combinations and flavor profiles using fresh, organic ingredients, homemade infusions and syrups, and classic spirits. 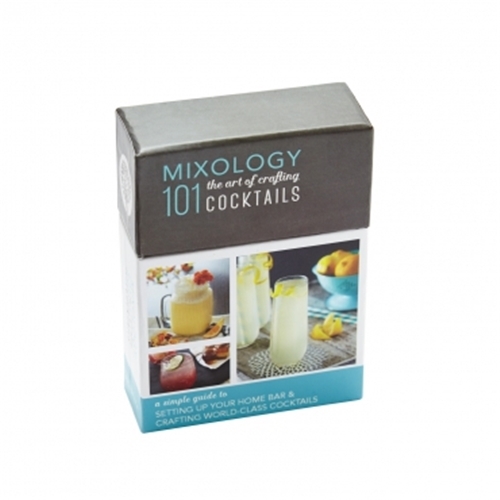 Mixology 101: The Art of Crafting Cocktails is a practical guide to starting your own cocktail-making adventure from setting up your own home bar to crafting original 100% homemade cocktails like a pro. Join St. Louis-based master mixologist, Matt Seiter, in this adventure, to discover the world of spirits, liqueurs, and modifiers, while learning about techniques, tools and glassware you’ll need to get started. This deck also provides 27 starter recipes including classic cocktails, syrups, infusions, and bitters, which will surely inspire you to become a creative mixologist! Deck includes 50 cards, plus a leaflet.